Gather resources and lead the way to safety after disaster strikes. "it was an engaging time management game. It fulfills my expectation of a time management game with some strategic skills to use. It has very good graphics and is easy to understand and play. It's worth every penny!" 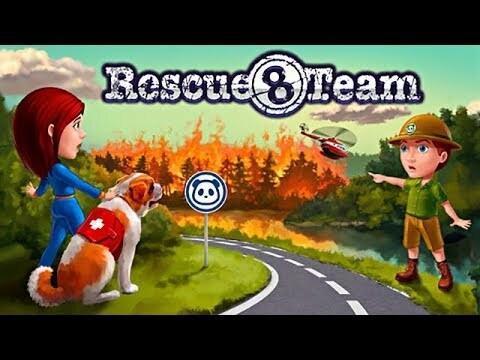 Lead the way to safety after disaster strikes as the Rescue Team faces dangers both natural and man made. Earthquakes and avalanches are just two of the catastrophes the Rescue Team encounters in this thrilling sequel. But the team can't blame every problem on Mother Nature because she has a little competition from Pietro Mangula, the world's most notorious poacher. When Mangula and his henchmen steal every animal off a reserve, FEMA calls in the Rescue Team to save the day. To deal with the mess Mangula leaves behind as he escapes, you must gather resources, remove obstacles and handle fires, floods, dark caves and more. Sound the alarm with Rescue Team 8. Liked this game a lot. Challenging levels of play. Liked the multi-click function and extra add-ons to make play faster and easier. Definitely would recommend this game. I really do love this game. It is fast paced and easy to play. I cannot wait for Rescue Team 9 to come out! Just hard enough to keep me interested, but not so hard that I get frustrated. Love the whole series and can’t wait till the next one!